After killing it with my Peach Raspberry Ice Lollies a few weeks ago, I thought it only fitting to give my specially imported ice lolly moulds another go. And this time I went boozy. I’m pretty sure Mojitos are everyone’s favourite cocktail. They went down a storm at our recent wedding after all. And you are going to love these lollies even more. 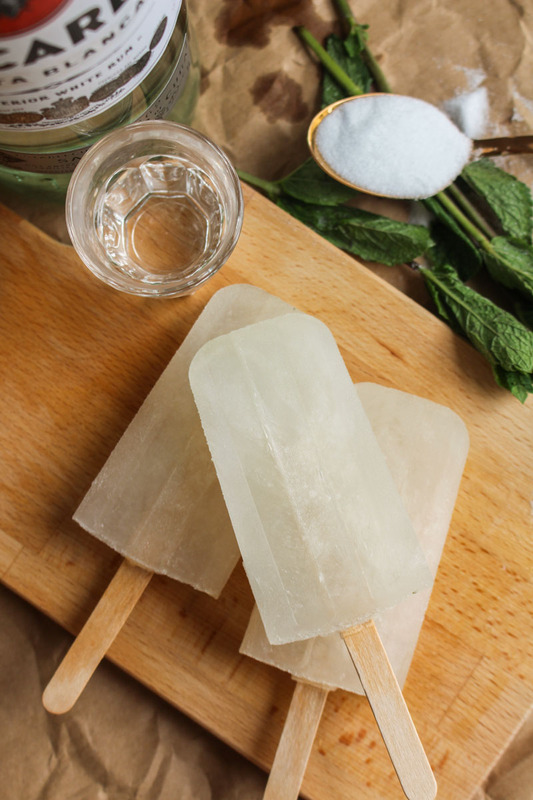 No need to have a constant supply of fresh mint and limes on hand this summer – just grab one of these ice pops from the freezer and chill. You can make these as boozy or as virgin as you like. The recipe below is pretty much the middle ground here – you can taste the rum, but it’s not overpowering. One ice lolly is not going to get you even tipsy. Well, unless you’re me. Apologies for the very lacklustre looking mint leaves above. I kept them around for too long and they wilted 🙁 Don’t worry, they were bright eyed and bushy tailed when I used them for my recipe! As usual, these lollies are absolutely fool-proof. You’re only going to need 5 ingredients, and a lolly mould. It doesn’t have to be the one I’m using – anything remotely lolly-shaped and freezable will do. Fresh mint and limes are a must, so make sure you run out and get these. You should be able to find everything else you need already at home. Especially if you have a stock of post-wedding booze that needs using up! I messed around with a couple of methods for getting the mint flavour into these lollies, but muddling up the leaves with the soda water and sugar definitely worked the best. Don’t be tempted to blend up the mint leaves in your food chopper – not a good look. It turns out that even if you are using a proper ice lolly mould, the sticks still sink to the bottom. I got round this problem by wrapping masking tape around the sticks about three quarters of the way up. This helped to stop them falling to the bottom. And no one wants a lolly with a one centimetre handle, do they. 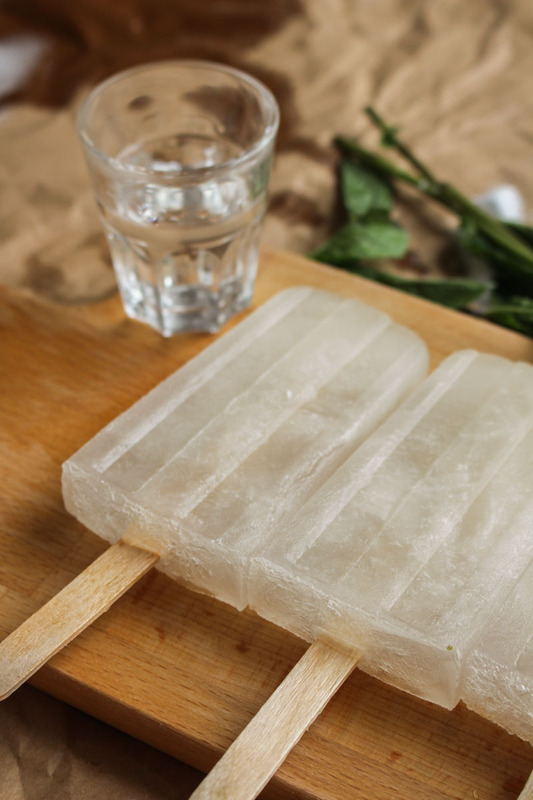 So, with the bank holiday ahead, can you honestly think of an excuse not to give these Mojito ice lollies a try? Everyone's favourite cocktail - in an ice lolly. The perfect treat to enjoy by the pool this summer. Preferably on one of those flamingo pool floats, yes? Pour the soda water into a jug or bowl, and add the mint leaves and sugar. Using a muddler, the end of a rolling pin, or anything else you can find, crush the mint leaves against the side of the jug or bowl, until they have all been damaged. This will probably take about one minute. Squeeze the juice of the limes into the jug/bowl, and add the rum. Give the cocktail a good mix, and then strain through a sieve to remove the mint leaves. 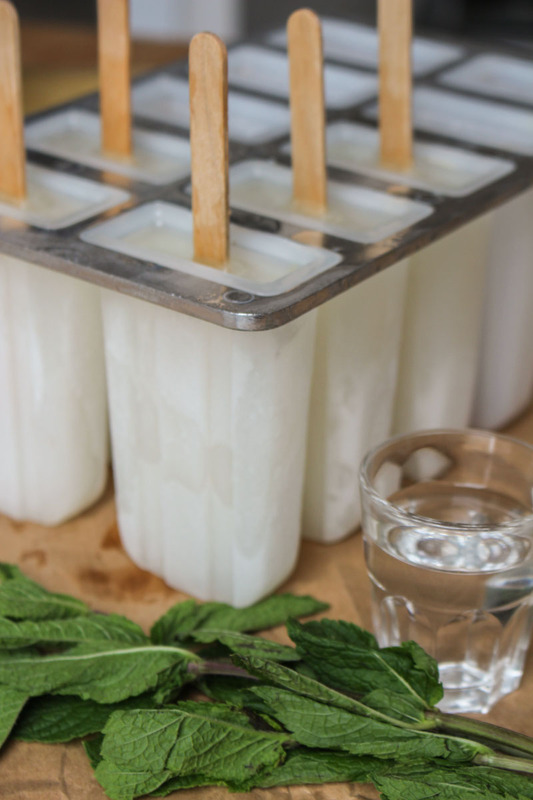 Pour the Mojito into your ice lolly moulds and insert the sticks. Use masking tape to keep the sticks from sinking if necessary. Place in the freezer to freeze completely. This will take at least 6 hours. Once ready, loosen the lollies from their moulds by running under warm water for a minute, and gently pulling out. 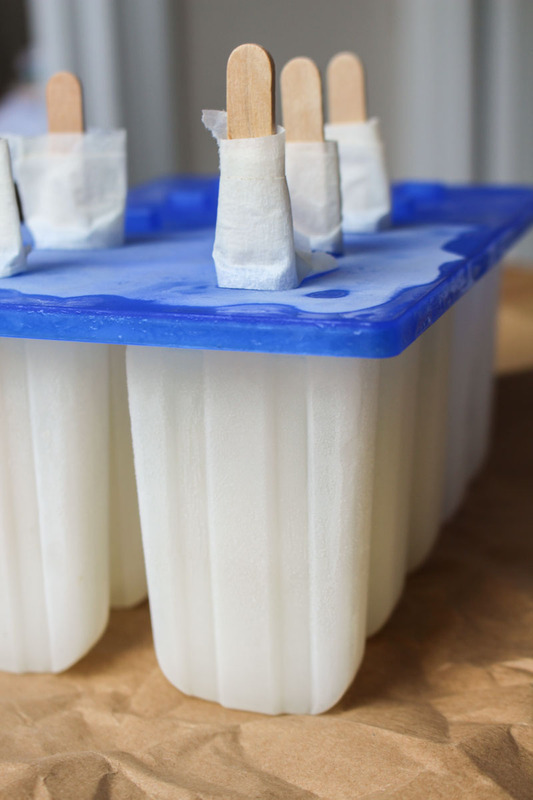 These ice lollies will keep in the freezer for up to 6 months.